The American Society of Landscape Architects (ASLA) recently held its fifth annual Diversity Summit in Washington, DC. NC State College of Design Landscape Architecture graduates Wesley Brown, ASLA, Courtney Hinson Cason, ASLA, Melissa Henao-Robledo, ASLA, and Darneka Waters, Associate ASLA were among the 26 participants in this year’s “super summit”. In year five, participants from each of the previous four years were invited back, along with six new invitees, to review progress to date and to plan for future activities. The summit was facilitated by Juanita Shearer-Swink, FASLA, as it has been for each of the four previous years. The first summit was held in 2013 to begin addressing the fact that the nation’s demographics are changing but the demographics within the landscape architecture profession don’t match the demographics of the country in terms of its racial and ethnic diversity. Census data projections show that the growth rates of both the African-American and Latino populations are increasing at faster rates than those of white Americans, even while the number of African-American and Latino graduates of landscape architecture programs remains not only stagnant, but low and far below the national levels. This trend poses a major challenge to the profession. To remain relevant and able to serve the country’s increasingly diverse communities, landscape architecture needs to become more ethnically and culturally diverse profession. To develop an understanding of the reasons that landscape architecture is not attracting a more diverse cross section of people into the profession and formulate strategies to begin to address these issues, the American Society of Landscape Architects (ASLA) inaugurated a Diversity Summit in Alexandria, Virginia, July 12-14, 2013. 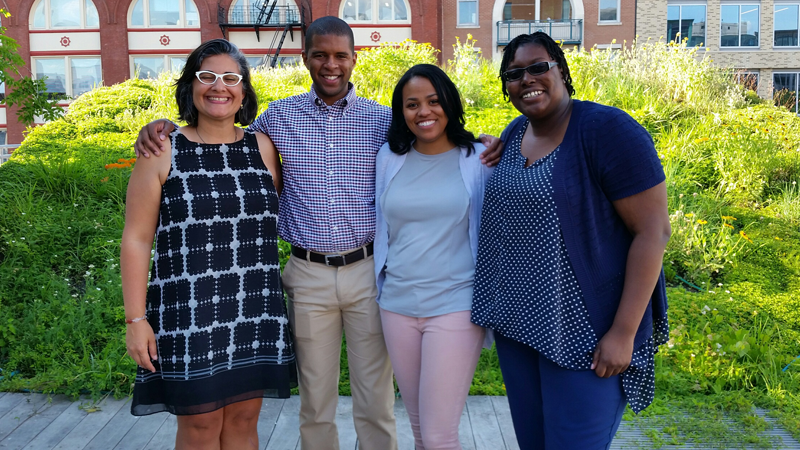 Ultimately six Latino and six African-American practitioners, most of whom were in the early stages of their careers, were able to participate in the 1½ day event which was facilitated by Juanita Shearer-Swink, FASLA. This event was continued annually, with six new participants each year as six rotated off. The NC State Department of Landscape Architecture has been well represented with Wesley Brown in the first class (2013), joined by Courtney Hinson Cason in the second (2014). Melissa Henao-Robledo entered with the class of 2016 and this year Darneka Waters was among the six new participants. Each person participates for two years and every summiteer was invited to be part of the five year review. Juanita Shearer-Swink, FASLA, has facilitated each of the summits. For more information, contact Shawn Balon at ASLA, sbalon@asla.org. Also check out the most recent article about the summit from ASLA.org!